* Create a Statement of Purpose. This is a specific, concrete, and short statement that sums up what you want the audience member's to learn during your session. * Research quotes, activities (please peruse www.thesource4ym.com), facts, handout possibles, stories, personal stories, etc. that could possibly make it into the final flow for your workshop. * Make sure everything you put in your binder is closely related to your workshops' statement of purpose. * If you find something on a web page, bookmark it, print it out and put it in your binder. * If you come across something that you find very interesting or you think might work for a different workshop, print it out and put it in your binder behind a "to use later" tab. * Get as much stuff as you can find. At this point, the more the merrier. If you have a tight Statement of Purpose, everything you put in the binder has a good chance of being valuable. * If you are giving a leadership or life skills related workshop, chances are good you might find some content you can use at my leadership blog (www.PersonalLeadershipInsight.com). Type in a related word in the search field on the home page of the PLI blog. The PLI Blog is indexed by Essential (Vision, Integrity, etc.). Scroll down on the right-hand side of the home page and you will see a section called Links. You can look at just the posts (there are over 250 total) for each Essential. If one of the Essentials looks like it might contain some content relevant to your workshop's Statement of Purpose, browse the posts and see if you can find some gems. For example, if you are doing a networking session, you will find some great posts on that in the Fostering Relationships posts. If you are doing a team communication workshop, obviously you will find some great posts in the Masterful Communication posts. Etc. Your audience has a ton of noise going on during your training session. The learning and retention of your content hinges on a number of factors, some big - some small. One big factor is your willingness and ability to get everyone physically plugged into the session. Concentrating the Room is about controlling the learning environment to produce the greatest chance for success and it is so simple to do. Just follow the techniques below. Does it take more time? Yes. Is it worth it? Absolutely. 2. Removes distractions, especially when you have a round table set-up. 3. Gets the audience physically engaged in the session and thus creates a boost of attention via heightened awareness, blood flow and brain activity. 4. Creates the perfect environment for Passionate Paul and helps Hostage Harriet to get plugged in. 5. Encourages growth in the trainer's confidence because the audience will be more attentive. Guaranteed. 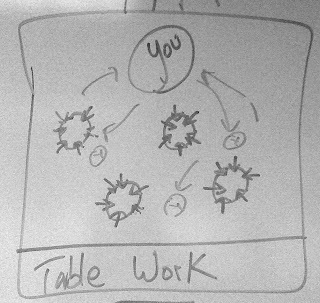 Table Work: You roaming the room. Audience seated at round tables facing each other. Unfortunately, most trainers who have a round table set-up just keep the audience members seated like this throughout the entire session. Everyone is facing different directions and many have their back to the trainer. If they are not looking at the trainer, they are facing a table full of distractions. You should keep the audience in Table Work position only when they are doing group work. High Receive: You in one spot. Chairs and audience members at tables, but facing directly toward you. 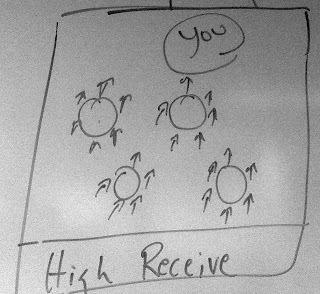 We use high receive all the time to make key points, video presentations, slide presentations, and big group discussions. High receive can easily be overused since the audience members remain at their tables. Don't overuse it. The point of any concentration technique is to make a significant directional change in their body language to create a more focused learning environment. If you overuse any one of these techniques, the technique becomes the norm and attention fatigue will set in. 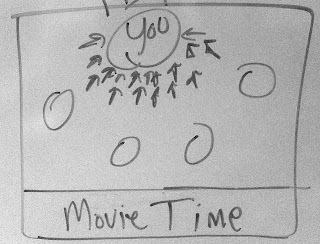 Movie Time: You in one spot. Audience members seated in amphitheater style around you. If you are planning a longer group discussion, illustrating a point with a story, or teaching from an easel, bring the audience forward and have them sit close to each other and close to you. 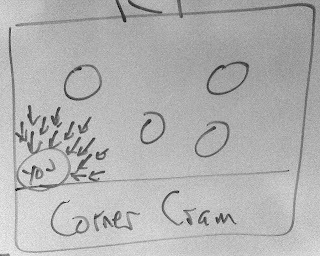 Corner Cram: You in the corner. Audience members seated in corner with you. Same as movie time, only in a corner. 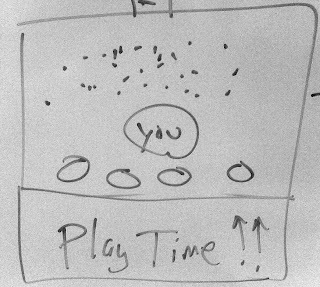 Play Time: You and the audience standing in an open area. If you are using an activity or exercise to illustrate a point, get the room set up like you need it by concentrating where the audience is standing as you give the directions. Push the tables and chairs out of the way, get all the audience members standing together in one place, get attention and go for it! If you are a presenter, chances are good you spend part of your time "speaking" and part of your time "facilitating." There is a big difference. Speaking is the act of verbally communicating information. Facilitating is the act of moving an audience via speaking, interaction, discussion, experiential exercises, multimedia, etc. 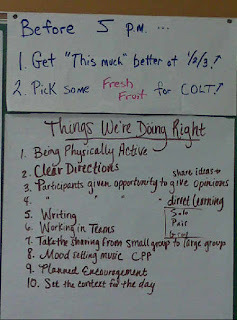 This particular list of 10 was co-developed by myself and the 08-09 Georgia FFA State Officers at Camp John Hope in June 2008. Thanks team!